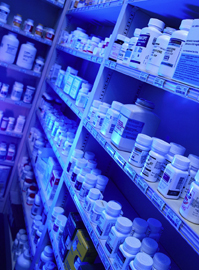 Should more patients have access to new drugs? Armed with new findings on the links between brain chemistry and mental illness, drug companies produced a new generation of drugs for schizophrenia, major depression and other severe psychiatric conditions. Most experts say up to 70 percent of the nation's 17.5 million adult sufferers could recover with access to the new drugs and strong social supports. Yet fewer than half receive any treatment, and the situation is eroding as cash-strapped states try to limit public subsidies for the higher-priced new drugs. Some say the new drugs often aren't worth the added costs, but others contend they are cheaper than the alternatives with older drugs — distressing risks and side-effects and more mentally ill people locked up in prison or homeless.